To bell the cat: To undertake a dangerous action in the service of a group. Peter van Onselen: Is Tony a one-trick pony? Laurie Oakes, 25 August 2012: Have you heard the one about the politician who lies? 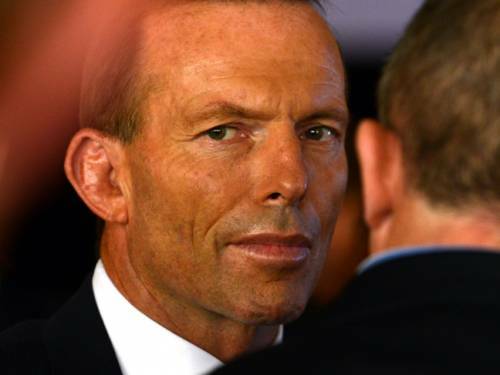 Drag0nista, 23 October 2011: Is the tide turning for Tony Abbott? Now included in the list. Well there’s a lot of foresight in that piece. Great to have your list. Thanks. It’ll be a small list. But there was Barry Cassidy, a first for the ABC AFAIK http://www.abc.net.au/news/2012-08-17/cassidy-a-rare-challenge-for-abbott/4203120. Thanks for these. All now included. This Laurie Oakes interview with Abbott is from the Howard era when Abbott was health minister (2005), and deals extensively with Abbott’s backdown on “an absolutely rock-solid, iron-clad commitment” given during the 2004 election campaign to a Medicare safety net. Basically Oakes is repeatedly calling him a liar to his face with words like: con, phony, lies, deception, etc. Yes, but on this occasion, Abbott is telling the truth! I’ll be reading it with interest. I am amused by the forlorn hope that attacking Tony Abbott in pieces like this one could have the slightest effect on the prospect of a Coalition victory at the next election. Those who are still supporting Labor may think this line of argument may help their cause but I think that as most swinging voters have already swung away from Gillard that you are all wasting your breath here. I take your point Iain but IMO criticising Abbott and LNP policy has more merit than just “trying to win an election”. LNP policies (those released at least) are poorly considered and won’t be improved until someone comes forward and outlines their inadequacies. My biggest complaint about the MSM is not rally for the removal of Gillard, but the failure to ensure we have a better replacement. It honestly reminds me of Germany in 1931/2 when the media failed to critique Mein Kampf. Hitler could have been a good leader if he had been kept to account on his weaknesses. Heh, heh, you are spot on Iain, although this isn’t an attempt to attack Abbott. I guess what I’m trying to do here is scope out the extent to which Abbott has been called out on his lies, and perhaps better understand why the criticisms are rarely sustained (by the MSM, at least). What is interesting about this collection is that there small clusters July 11, Oct/Nov 11, Keane\’s anomoly in March 12, and then the Aug 12 cluster (inlcuding Cassidy\’s piece cited in the comments). Given his consistent record of losesness with the truth, and his own flip floppery positions, I find it very suprosing that there are only a few minor clusters (until recently) the \”bell the cat\” so to speak. Why does it matter that much Brian when Abbott is up against Labor who seem incapable of either doing anything right or of they do do something right getting any credit for it. To suggest there is any choice other than Labor or Liberal is to misrepresent our political landscape. Labor is utterly hopeless and you want to quibble about the coalitions policy development and public debate. If we are realistic all that the coalition has to argue is that they would be more competent administrators than Labor have over the last five years and that is enough for most voters who are frankly rather sick of the constant reform agendas produced by both sides of the house. I agree, but looking beyond the election, Australia needs a party that takes the Nation forward, unlike the LNP State Governments that have no vision and no promises to fulfill and are leaving voters disappointed. He has a $75b unfunded deficit that would make Greece blush, a direct action plan that will cost tax paying households $1300 each with no compensation (great for the economy!?) and will return Aust to the days of ignoring economically productive national infrastructure (such as NBN, rail, shipping etc). I’m not bothered about Abbott winning, more about the mess he’ll make because no-one asked him to proof read his policies (like increasing company tax WTF?). Surely the economically conservative Liberals are starting to question Abbott’s socialist policies such as Direct Action and his excessive Paid Maternity Leave. What you should be more bothered about is how Labor will be able reinvent themselves well enough to be a vibel government again in your lifetime. Frankly I hope that They drop their “direct action” policy but I’m indifferent about the Maternity scheme and I don;t think taht it is such a bad idea to encourage growing our own Aussies rather than relying on imports. You’ll need to explain why you think the ALP have done such a bad job. Abbott and Hockey wouldn’t have done m8uch differently (Immigration, NBN, Carbon Tax are the only policy differences). Public don’t care about policies, or quality of a party. Look at the lies, deciet and bad policy with the LNP. I use the LNP policies in Economics classes as examples of Gov intervention of the worst kind. ALP has economic governance credibility, the LNP has a record of hopeless management. Give me examples, I’ll probably agree but find some that the LNP wouldn’t have done themselves. You’ll need to explain why you think the ALP have done such a bad job. Abbott and Hockey wouldn’t have done much differently (Immigration, NBN, Carbon Tax are the only policy differences). Changed the policy on the way boat people are processed therefore creating the flood that we are seeing now and then lied about it all being about “push factors” rather than the pull factors that they had created.On top of that they then stuffed up fixing the problem, and even now they baulk at reintroducing TPVs and instructing the navy to turn boats back. Labor have taken a budget position of strong surpluses and turned it into consistent deficits and even the tiny surplus announced in the last budget is unlikely to materialise. Then we have Gillard’s Carbon tax which in the first instance she promised not to introduce in a deliberate Lie to the public and then she agreed to introduce to buy government from the Greens and independents. The NBN may be good in theory but in practice it seems to me to be a Rolls Royce solution to a Ford problem with the attendant and ever rising price tag. The ALP started in power with such promise and a good position in the Parliament but they squandered it all on two useless policies, Climate change, and Border control, and its the bitter memory of those follies that will keep them in the political wilderness for a generation at the very least. ALP had to respond to the GFC immediately and spend the cash Costello had been saving during the boom (Simple Keynesian economics I teach it to yr 11). Notice that it’s “Waste” if the Govt spends it, but if the Govt hands out $100billion in tax cuts (which Costello did), that’s “Prudent” spending? Sure the Pink Batts were poorly organised, BER had issues (most was spent on sun shelter for playgrounds as not all schools needed a building), BER was well spent (I’m a teacher so I’m biased). Carbon Tax was a good idea according to Abbott. We would have a Carbon Tax under Abbott and the LNP officially supported a carbon tax prior to Abbott taking LOTO, so that doesn’t count. Abbott’s hypocrisy does. http://www.youtube.com/watch?v=ckcH0Wrmy74. The hung parliament has made it difficult for the ALP to deliver their grand promises, and the ALP will be blamed for those failures (though not being directly responsible). Equally the Greens will be accountable given they hold the balance of power. ALP has fought ideological battles with climate change and border control, unlike the LNP who can’t decide what they believe (Maylasia has stronger controls than Nauru and Manus Island did when they were opened). I’m not sure if the electorate will be moved by ideological battles between the two parties. Maybe but the big question is did they need to go into panic mode in the process and not only spend all of the accumulated savings made by Costello but also run up a huge debt as well? Sure my son’s school has a nice new library as well but I still question the “bang for our bucks” issue and just what benefit to the education of our children there is in fancy buildings rather than more teachers to be honest. Carbon Tax was a good idea according to Abbott. We would have a Carbon Tax under Abbott and the LNP officially supported a carbon tax prior to Abbott taking LOTO, so that doesn’t count. Abbott’s hypocrisy does. I actaully think that it was the back-flip more than anything that has done for Gillard and for a Labor supporter it must be a very bitter pill indeed because if only she had said to the Greens and the independents, who were so hot for a carbon tax, that she would not do it until after the next election and if they don’t like it then they can talk to Tony. Instead she just gave in too easily. I don’t either because I think that they have just turned right off anything that Labor says. So spending $100b on productive infrastructure is waste, but giving $100b to private corporations and middle class families is not? Will take Aust 10 years to rebuild the Nation after Costello/Howard/Abbott drained the Nation of port, road and rail infrastructure, left our public schools and hospitals to rot while private corporations swim in tax payer funds (I support private school funding, but not when a school can save more in a year than the total cost of running an equally sized public school), and not to mention the disaster of the FHOG which will take much longer than 10 years to recover from (if we don’t have a market collapse). In the year and up to the day before Abbott became LOTO, Abbott supported an ETS/Carbon Tax. He changed beliefs in order to become LOTO and shaft Turnbull who support an ETS (as had Howard). Backflips are nothing major in politics, at least Gillard showed her colours in trying not to backflip on CT and Immigration. productive infrastructure??? look school buildings a nice and tehy are cute but would the education of the countries children have missed them? I don’t think so. What do you mean by the part I have emboldened Brian? and not to mention the disaster of the FHOG which will take much longer than 10 years to recover from (if we don’t have a market collapse). How was the FHOG a disaster? I agree about the prioritises being the Key but I don’t agree that tax cuts are “socialist waste” for that I think that you need look no further than Gillard’s spending to compensate in the wake of her carbon tax . Yeah but that was then and thsi is now and, most importantly he never fronted the Australian peopel with the (now broken) promise “there will be no carbon tax under a government that I lead” did he? Sure but its how you present the back flip or change of direction that matters. Oh and the timing has a lot to do with it as well. For example had Gillard done in 2010 what she has finally done on immigration my guess is that she would have more credibility on the issue now. The embedded media giving Mr-Rabbit a free ride.